The Bay of Bengal, the largest bay in the world, forms the northeastern part of the Indian Ocean. Roughly triangular in shape, it is bordered mostly by India and Sri Lanka to the west, Bangladesh to the north, and Burma (Myanmar) and the Andaman and Nicobar Islands to the east. The Bay of Bengal occupies an area of 2,172,000 km². A number of large rivers – the Ganges and its distributaries such as Padma and Hooghly, the Brahmaputra and its distributaries such as Jamuna and Meghna, other rivers such as Irrawaddy River, Godavari, Mahanadi, Krishna and Kaveri flow into the Bay of Bengal. Among the important ports are Chennai, Chittagong, Kolkata, Mongla, Paradip, Tuticorin, Visakhapatnam and Yangon. ^ "Bay of Bengal". Wildlife Conservation Society. Retrieved 1 December 2012. ^ "Limits of Oceans and Seas, 3rd edition". International Hydrographic Organization. 1953. Retrieved 7 February 2010. ^ Kuttan (2009). The Great Philosophers of India. AuthorHouse. ^ "Dhanushkodi". indiatourism4u.in. Retrieved 21 August 2013. ^ Wasson, Robert (2003). "A sediment budget for the Ganga–Brahmaputra catchment" (PDF). Current Science 84 (8): 1041–1047. 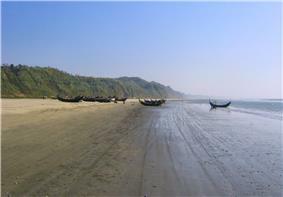 ^ "World's longest beach hidden in Bangladesh". The Sydney Morning Herald. 31 January 2007. ^ Curray, Joseph R.; Frans J. Emmel; David G. Moore (December 2002). "The Bengal Fan: morphology, geometry, stratigraphy, history and processes". Marine and Petroleum Geology (Elsevier Science Ltd) 19 (10): 1191–1223. ^ France-Lanord, Christian; Volkhard Spiess; Peter Molnar; Joseph R. Curray (March 2000). "Summary on the Bengal Fan: An introduction to a drilling proposal". Woods Hole Oceanographic Institution. ^ David Brewster. "Dividing Lines: Evolving Mental Maps of the Bay of Bengal. Retrieved 13 August 2014". ^ Odisha Government, e-magazine. "Universal Brotherhood and the Temple of Lord Jagannath at Paradip". Retrieved 6 February 2013. 1778 to 1783 The Naval operations in the American Revolutionary War or American War of Independence ranged as far as the Bay of Bengal. c1816 Mornington Ship burned in the Bay of Bengal. 1850 American clipper brig Eagle is supposed to have sunk in the Bay of Bengal. American Baptist missionary Adoniram Judson, Jr. died 12 April 1850 and was buried at sea in the Bay of Bengal. 1855 The Bark "Incredible" struck on a sunken rock in the Bay of Bengal. 1865, a gale dismasted the Euterpe while traversing the Bay of Bengal typhoon. 1875 Veleda 76 m (250 ft) long and 15 m (50 ft) wide is a part of a current salvage operation. 1942 Japanese cruiser Yura of the Second Expeditionary Fleet, Malay Force attacked merchant ships in the Bay of Bengal. 1971 December 3 - It was claimed that Indian Navy destroyer INS Rajput sunk the Pakistan Navy submarine PNS Ghazi off Visakapatnam, in the Bay of Bengal. Maritime archaeology or marine archaeology is the study of material remains of ancient peoples. A specialized branch, Archaeology of shipwrecks studies the salvaged artifacts of ancient ships. Stone anchors, amphorae shards, elephant tusks, hippopotamus teeth, ceramic pottery, a rare wood mast and lead ingots are examples which may survive the test of time for archaeologists to study and place the salvaged findings into a time line of history. Coral reefs, tsunamis, cyclones, mangrove swamps, battles and a criss cross of sea routes in a high trading area combined with pirating have all contributed to shipwrecks in the Bay of Bengal. 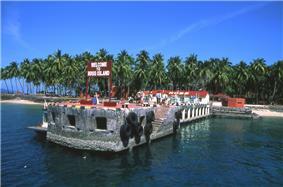 Cellular Jail or "Black Waters" built in 1896 on Ross Island, a part of the Andaman Island Chain. As early as 1858 this island was used as a British penal colony for political prisoners facing life imprisonment. Northern Circars occupied the western coast of the Bay of Bengal and is now considered to be India's Madras state. Chola dynasty (9th century to 12th century) when ruled by Rajaraja Chola I occupied the western coastline of the Bay of Bengal circa AD 1014, The Bay of Bengal was also called as the Chola Lake.The Kakatiya dynasty reached the western coastline of the Bay of Bengal between the Godavari and the Krishna rivers. Kushanas about the middle of the 1st century AD invaded northern India perhaps extending as far as the Bay of Bengal. Chandragupta Maurya extended the Maurya Dynasty across Northern India to the Bay of Bengal. Hajipur was a stronghold of Portuguese Pirates. In the 16th century the Portuguese built trading posts in the North of the Bay of Bengal at Chittagong (Porto Grande) and Satgaon (Porto Pequeno). Before the arrival of British to India it was also known as "Kalinga Sagar". The major transboundary issues relating to Sedimentation and most heavy metal contamination tend to be localized and lack a strong transboundary dimension. The main causes of the issues are: increasing coastal population density and urbanization; higher consumption, resulting in more waste generated per person; insufficient funds allocated to waste management; migration of industry into BOBLME countries; and proliferation of small industries. 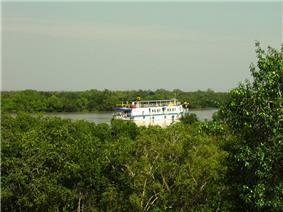 The Bay of Bengal is an area of high biodiversity, with a large number of endangered and vulnerable species. The major transboundary issues relating to habitats are: the loss and degradation of mangrove habitats; degradation of coral reefs; and the loss of, and damage to, seagrasses. The transboundary nature of these major issues are: that all three critical habitats occur in all BOBLME countries. Coastal development for several varying uses of the land and sea are common in all BOBLME countries. Trade in products from all the habitats is transboundary in nature. Climate change impacts are shared by all BOBLME countries. The main causes of the issues are: food security needs of the coastal poor; lack of coastal development plans; increasing trade in products from coastal habitats; coastal development and industrialization; ineffective marine protected areas and lack of enforcement; upstream development that affects water-flow; intensive upstream agricultural practices; and increasing tourism. Fisheries production in the Bay of Bengal is six million tonnes per year, more than seven percent of the world's catch. The major transboundary issues relating to shared fisheries are: a decline in the overall availability of fish resources; changes in species composition of catches; the high proportion of juvenile fish in the catch; and changes in marine biodiversity, especially through loss of vulnerable and endangered species. The transboundary nature of these issues are: that many fish stocks are shared between BOBLME countries through the transboundary migration of fish, or larvae. Fishing overlaps national jurisdictions, both legally and illegally – overcapacity and overfishing in one location forces a migration of fishers and vessels to other locations. All countries (to a greater or lesser degree) are experiencing difficulties in implementing fisheries management, especially the ecosystem approach to fisheries. Bay of Bengal countries contribute significantly to the global problem of loss of vulnerable and endangered species. The main causes of the issues are: open access to fishing grounds; Government emphasis on increasing fish catches; inappropriate government subsidies provided to fishers; increasing fishing effort, especially from trawlers and purse seiners; high consumer demand for fish, including for seed and fishmeal for aquaculture; ineffective fisheries management; and illegal and destructive fishing. A transboundary issue is defined as an environmental problem in which either the cause of the problem and/or its impact is separated by a national boundary; or the problem contributes to a global environmental problem and finding regional solutions is considered to be a global environmental benefit. The eight Bay of Bengal countries have (2012) identified three major transboundary problems (or areas of concern) affecting the health of the Bay, that they can work on together. With the support of the Bay Of Bengal Large Marine Ecosystem Project (BOBLME), the eight countries are now (2012) developing responses to these issues and their causes, for future implementation as the Strategic Action Programme. The Asian brown cloud, a layer of air pollution that covers much of South Asia and the Indian Ocean every year between January and March, and possibly also during earlier and later months, hangs over the Bay of Bengal. It is considered to be a combination of vehicle exhaust, smoke from cooking fires, and industrial discharges. It has been argued that the conceptual division of the Bay of Bengal region between South Asia and Southeast Asia may no longer be appropriate and that the rise of India as a major power may lead to a new mental mapping of the Bay of Bengal as a coherent strategic region. The disputed maritime boundary between Bangladesh and Myanmar has twice resulted in military tensions, in 2008 and 2009. Bangladesh is currently pursuing a settlement with Myanmar and India to the boundary dispute through the International Tribunal on the Law of the Sea. China has recently made some efforts to project influence into the region through tie-ups with Myanmar and Bangladesh. The United States held several major exercises with Bangladesh, India, Malaysia, Singapore and Thailand. The largest ever wargame in Bay of Bengal, known as Malabar 2007, was held in 2007 and naval warships from US, Singapore, Japan and Australia took part in it. India, was also a participant. Large deposits of natural gas also incited a serious up for grabs urgency by India. Disputes over rights of some oil and gas blocks have caused brief diplomatic spats between Myanmar and India with Bangladesh. The Bay of Bengal is strategically crucial for India since it is a natural extension of its sphere of influence. Secondly because of the presence of outlying islands, namely Andaman islands and Nicobar islands and most importantly several major ports such as Kolkata, Chennai, Visakhapatnam, and Tuticorin along its coast with the Bay of Bengal. 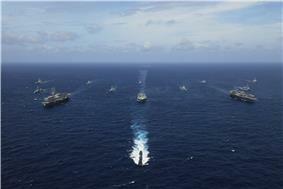 Image of United States ships participating in the MALABAR 07 Naval Exercise. Aegis cruisers from the navies of Japan and Australia, and logistical support ships from Singapore and India in the Bay of Bengal also took part. Thoni and catamaran fishing boats of fishing villages thrive along the Bay of Bengal shorelines. Fishermen can catch between 26 and 44 species of marine fish. In one year, the average catch is two million tons of fish from the Bay of Bengal alone. Approximately 31% of the world’s coastal fishermen live and work on the bay. The Sethusamudram Shipping Canal Project is a new venture proposed which would create a channel for a shipping route to link the Gulf of Mannar with the Bay of Bengal. This would connect India east to west without the necessity of going around Sri Lanka. BIMSTEC Bay of Bengal Initiative for MultiSectoral Technical and Economic Cooperation (BIMSTEC) supports free trade internationally around the Bay of Bengal between Bangladesh, Bhutan, India, Myanmar, Nepal, Sri Lanka, and Thailand. One of the first trading ventures along the Bay of Bengal was The Company of Merchants of London Trading into the East Indies more commonly referred to as British East India Company. Gopalpur-on-Sea was one of their main trading centers. Other trading companies along the Bay of Bengal shorelines were English East India Company and French East India Company. The ancient Buddhist heritage sites of Pavurallakonda, Thotlakonda and Bavikonda lie along the coast of Bay of Bengal at Visakhapatnam in India. The remains of the Sri Vaisakheswara Swamy temple lie under the Bay of Bengal. Spokespeople from Andhra University Centre for Marine Archaeology say the temple may be located opposite the Coastal Battery. The Jagannath Temple at Puri which is the one of the fore scared places in Hindu pilgrimage along with puri sea beach situated on the banks of Bay of Bengal. Mahodadhi was named after Lord Jagannath. 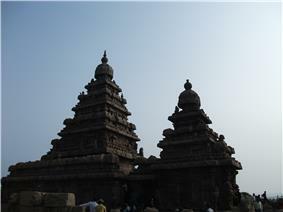 Seven Pagodas of Mahabalipuram is the name for Mahabalipuram. Mahabalipuram's Shore Temple was constructed in the 8th century AD and myth has it that six other temples were also built here. Another historic site which has been preserved is Vivekanandar Illam. It was constructed in 1842 by the Ice King Frederic Tudor to store and market ice year round. In 1897, Swami Vivekananda famous lectures were recorded here at Castle Kernan. The site is an exhibition devoted to Swami Vivekananda and his legacy. Konark is the home of the Sun Temple or Black Pagoda. This Brahman sanctuary was built of black granite mid 1200 AD and has been declared a World Heritage Site. Ramanathaswami Temple located at Dhanushkodi, where the Bay of Bengal and the Indian Ocean come together. The Calcutta cyclone of 1864: caused a storm surge of 40 feet. Barometer 28.025 inches of mercury. 50,000 direct deaths and 30,000 from disease. The Backergunge cyclone of 1876: 10 to 30 or 40 feet storm surge. 100,000 direct deaths and 100,000 indirect from disease. The False Point cyclone of 1885: 22 feet of storm surge. Barometer 27.135 inches of mercury. A tropical storm with rotating winds blowing at speeds of 74 miles (119 kilometres) per hour is called a cyclone when they originate over the Bay of Bengal; and called a hurricane in the Atlantic. 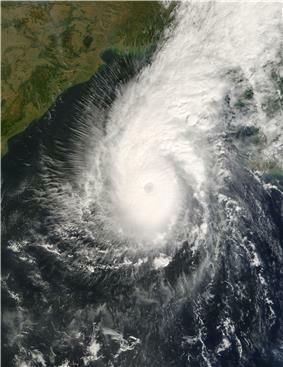 Between 100,000 and 500,000 residents of Bangladesh were killed because of the 1970 Bhola cyclone. The remainder of the year, the counterclockwise current is southwestward flowing, and the circulation pattern is called the East Indian Winter Jet. September and December see very active weather, season varsha (or monsoon), in the Bay of Bengal producing severe Cyclones which affect Eastern India. Several efforts have been initiated to cope with Storm surge. From January to October, the current is northward flowing, and the clockwise circulation pattern is called the "East Indian Current." The Bay of Bengal monsoon moves in a northwest direction striking the Nicobar Islands, and the Andaman Islands first end of May, then the North Eastern Coast of India by end of June. Coastal regions bordering the Bay of Bengal are rich in minerals. Sri Lanka, Serendib, or Ratna – Dweepa which means Gem Island. Amethyst, beryl, ruby, sapphire, topaz, and garnet are just some of the gems of Sri Lanka. Garnet and other precious gems are also found in abundance in the Indian states of Odisha and Andhra Pradesh. Another endangered species Royal Bengal Tiger is supported by Sundarbans a large estuarine delta that holds a mangrove area in the Ganges River Delta. The Great Nicobar Biosphere Reserve provides sanctuary to many animals some of which include the saltwater crocodile (Crocodylus porosus), giant Leatherback Sea Turtle (Dermochelys coriacea), and Malayan box turtle (Cuora amboinensis kamaroma) to name a few. Kerilia jerdonii is a sea snake of the Bay of Bengal. Glory of Bengal Cone (Conus bengalensis) is just one of the seashells which can be photographed along beaches of the Bay of Bengal. An endangered species, the Olive Ridley sea turtle can survive because of the nesting grounds made available at the Gahirmatha Marine Wildlife Sanctuary, Gahirmatha Beach, Odisha, India. Marlin, barracuda, skipjack tuna, (Katsuwonus pelamis), yellowfin tuna, Indo-Pacific humpbacked dolphin (Sousa chinensis), and Bryde's whale (Balaenoptera edeni) are a few of the marine animals. Bay of Bengal Hogfish (Bodianus neilli) is a type of Wrass which live in turbid lagoon reefs or shallow coastal reefs. Schools of dolphins can be seen, whether they are the bottle nose dolphin (Tursiops truncatus), Pantropical spotted dolphin (Stenella attenuata) or the spinner dolphin (Stenella longirostris) . Tuna and dolphins are usually residing in the same waters. In shallower and warmer coastal waters the Irrawaddy Dolphins (Orcaella brevirostris) can be found. The Bay of Bengal is full of biological diversity, diverging amongst coral reefs, estuaries, fish spawning and nursery areas, and mangroves. The Bay of Bengal is one of the World's 64 largest marine ecosystems. Swatch of No Ground is a 14 km-wide deep sea canyon of the Bay of Bengal. The deepest recorded area of this valley is about 1340 m. The submarine canyon is part of the Bengal Fan, the largest submarine fan in the world. A zone 50 m wide extending from the island of Ceylon and the Coromandel coast to the head of the bay, and thence southwards through a strip embracing the Andaman and Nicobar islands, is bounded by the 100 fathom line of sea bottom; some 50 m. beyond this lies the 500-fathom limit. Opposite the mouth of the Ganges, however, the intervals between these depths are very much extended by deltaic influence. The lithosphere of the earth is broken up into what are called tectonic plates. Underneath the Bay of Bengal is the Indian Plate which is part of the great Indo-Australian Plate and is slowly moving north east. This plate meets the Burma Microplate at the Sunda Trench. The Nicobar Islands, and the Andaman Islands are part of the Burma Microplate. The India Plate subducts beneath the Burma Plate at the Sunda Trench or Java Trench. Here, the pressure of the two plates on each other increase pressure and temperature resulting in the formation of volcanoes such as the volcanoes in Myanmar, and a volcanic arc called the Sunda Arc. Sumatra-Andaman earthquake and Asian Tsunami was a result of the pressure at this zone causing a submarine earthquake which then resulted in a huge Tsunami. The Bay of Bengal is a salt water sea and is a part of the Indian Ocean. The islands in the bay are numerous, including the Andaman Islands, Nicobar and Mergui groups of India. The Cheduba group of islands, in the north-east, off the Burmese coast, are remarkable for a chain of mud volcanoes, which are occasionally active. Great Andaman is the main archipelago or island group of the Andaman Islands, whereas Ritchie's Archipelago consists of smaller islands. Only 37, or 6.5%, of the 572 islands and islets of the Andaman and Nicobar Islands are inhabited. Some of the biggest ports in the world — Chittagong in Bangladesh and Visakhapatnam, Chennai in India— are in the bay. Mongla, Kolkata and Yangon, the largest city and former capital of Burma, are also important ports on the bay. 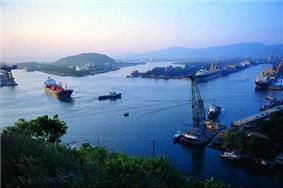 Other Indian ports on the bay include: Kakinada, Pondicherry, Paradip, Dhamra, Gopalpur. The Irrawaddy River also spelt as Ayeyarwady of Burma flows into Andaman Sea of Bay of Bengal and once had thick mangrove forest of its own. Further south of Bengal, Mahanadi River, Godavari River, Krishna River and Kaveri River (earlier spelt as Cauvery) are the major rivers that flow from west to east in Indian subcontinent and drain into Bay of Bengal. Many small rivers also drain directly into Bay of Bengal; the shortest of them is Cooum River at 64 km (40 mi). The Ganga–Brahmaputra rivers contribute nearly 1000 million tons/yr of gas hydrate reserves. Bangladesh can reclaim land substantially and economically from the sea area by constructing sea dikes / bunds/ Causeway and trapping the sediment from its rivers. Many major rivers of the Indian subcontinent flow west to east before draining into Bay of Bengal. The Ganges is the northernmost of them. Its main channel enters and flows through Bangladesh, where it is called Padma River, before joining Meghna River. However, Brahmaputra River flows from east to west in Assam before turning south and entering Bangladesh where it is called Jamuna River. Jamuna joins Padma and then Padma joins Meghna River that finally drains into Bay of Bengal. The Sundarbans mangrove forest is formed at the delta of the Ganges, Brahmaputra and Meghna rivers and lies partly in West Bengal and partly in Bangladesh. Brahmaputra at 2,948 km (1,832 mi) is the 28th longest River in the world. It originates in Tibet. Hooghly River, another channel of the Ganga that flows through Calcutta drains into Bay of Bengal in India itself. According to ancient Hindu scriptures, this water body has been referred to as Mahodadhi The Bay of Bengal appears as Sinus Gangeticus or Gangeticus Sinus, meaning "Gulf of the Ganges", in ancient maps. In the 10th century the explosion of Indianized kingdoms, led by the Chola Empire, resulted in the Bay of Bengal being known as the Chola Lake. 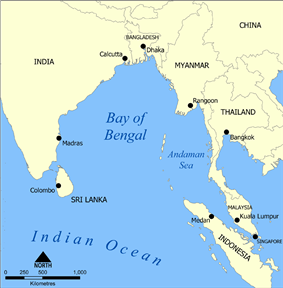 It later came to be known as Bay of Bengal after the region of Bengal. On the South. Adam's Bridge (between India and Ceylon [Sri Lanka]) and from the Southern extreme of Dondra Head (South point of Ceylon) to the North point of Poeloe Bras (). On the East. A line running from Cape Negrais (16°03'N) in Burma through the larger islands of the Andaman group, in such a way that all the narrow waters between the islands lie to the Eastward of the line and are excluded from the Bay of Bengal, as far as a point in Little Andaman Island in latitude 10°48'N, longitude 92°24'E and thence along the Southwest limit of the Burma Sea [A line running from Oedjong Raja () in Sumatra to Poeloe Bras (Breuëh) and on through the Western Islands of the Nicobar Group to Sandy Point in Little Andaman Island, in such a way that all the narrow waters appertain to the Burma Sea].